The Computer Science Department was established in 1991 at the Faculty of Arts and Sciences. 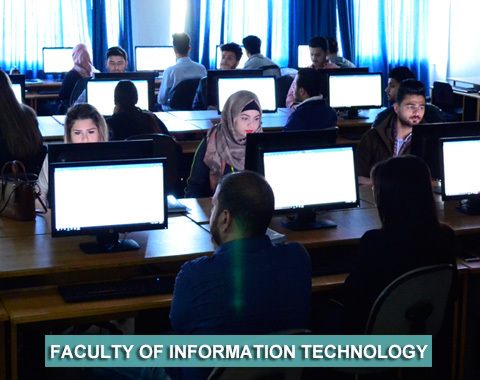 It became an important department at the Faculty of Information Technology in 2001. The Department offers a Bachelor’s Degree in computer science. The study plan includes compulsory and elective courses totaling 132 credit hours of general principles in computer science and modern technology, in line with market demands and huge developments in computer science. The computer science department aspires to be the national and regional pioneer in providing excellent education, scientific research, and knowledge building in the field of computer science. Our mission is to provide a distinguished education in a creative environment which copes with the latest developments in the field of computer science. It will meet quality assurance standards that fulfill the requirements of the national and international accreditation to obtain high quality outputs which fulfill labor market needs. It will also stimulate scientific research and strengthen cooperation with the local community. Provide students with theoretical and practical knowledge in computer science. To train students and enhance their abilities in the methods of programming, computer operating systems, and network management. To align the academic programs with the latest developments and updates. To upgrade the qualifications of the faculty members. To cooperate with similar departments in other universities in the areas of scientific research and teaching. To encourage faculty members and students to get involved in scientific research. To highlight the need for members of staff to steadily bring themselves up to date in their fields.